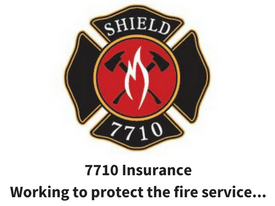 As firefighters we protect life and property by any means necessary. And by “any” we mean the “safest and the best.” This means we do not marry ourselves to any one response modality or school of thought. We don’t always go interior on a fire attack…or always use a Halligan to force open a door (sometimes it’s already unlocked) right? We take into account certain factors along with the environment, resources, etc. and make the best tactical decisions we can. Granted, we do have protocols and procedures to follow that help guide us along our process but we must be able to adapt and compromise. Trainers, chiefs and officers should take this same approach to creating a fitness program for recruits. There is no “best” workout program for recruits, just as there is no “best” way to force a door. Going into a situation, a well prepared firefighter should have a plan in the back of their head but also must be able to adapt to changing conditions. To create an effective recruit fitness program, trainers, chiefs and officers must take into consideration the specific needs of the recruits and the demands of the fire academy. The goals of the recruit academy fitness program should be to 1) prepare the recruit for the demands of being a fire rescue athlete and 2) teach them how to utilize proper fitness modalities to prolong their career. Let’s look at the first part of that goal. When a recruit finishes the academy they need to be ready for almost any event…strong enough to routinely carry, able to lift and drag loads of 50 to 100 pounds, have the balance to climb stairs and ladders, the power to swing heavy mallets and axes, and the muscular endurance to recover from these events quickly and be able to perform them for prolonged periods of time. Oh yes, I forgot to mention that they must be able to do all of these things in awkward positions and sometimes on unstable planes. OK, so maybe designing a program for the fire rescue athlete (recruit) is not so easy. But, by strategically using different training modalities in a planned progression, an effective fitness plan or “protocol” can be created. Before we begin to plan the recruit fitness program, it is essential that we talk about the concept of periodization. Periodization is the systematic application of overload through a preplanned variation of program components to optimize gains in strength and endurance while preventing overuse, staleness, over-training, injury and plateaus. While that sounds pretty technical, it basically means that periodization is a plan that is used to effectively and efficiently maximize fitness gains. Research has shown periodized programs are superior in eliciting fitness improvements. 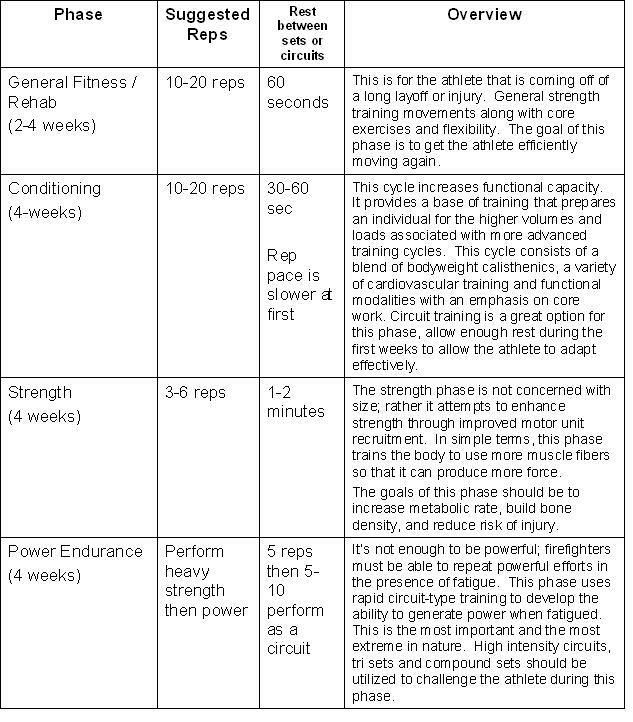 The periodization model consists of various training periods or components. These components are distinct periods of time you are working with like the training session, week, and/or cycle. Identifying, defining and organizing these components allow the trainer to easily accomplish several things. First, organizing the components provides a developmental progression which keeps the training effective and safe. Second, the organization of these components keeps the training changing and interesting. Last, organizing the various components of periodization provides a direction to peak performance; this keeps the training optimal. Training should follow a developmental approach. This means there should be a hierarchy of training. 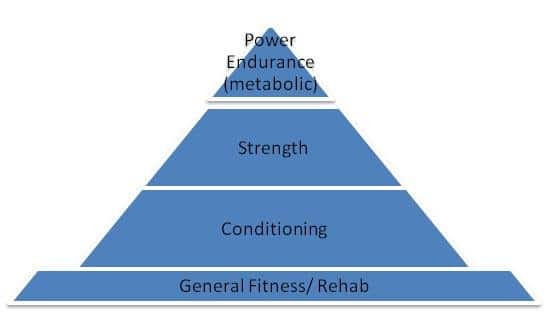 First it is essential for the athlete to develop a training base that should increase the body’s functional capacity. Once this is accomplished, the intensity of the exercise is increased to emphasize strength development. This period is characterized by lower volumes of work and higher intensities. In more general terms, we can also say we develop stability, then strength, and finally power. Regardless of what the training program looks like, it cannot violate this developmental approach. If the recruit’s joints aren’t stable, they cannot be heavily loaded. Likewise, if their muscles have not been conditioned, they cannot produce fast, high-intensity contractions (power). If this developmental approach is not followed, the likelihood of an injury and/or over training greatly increases. 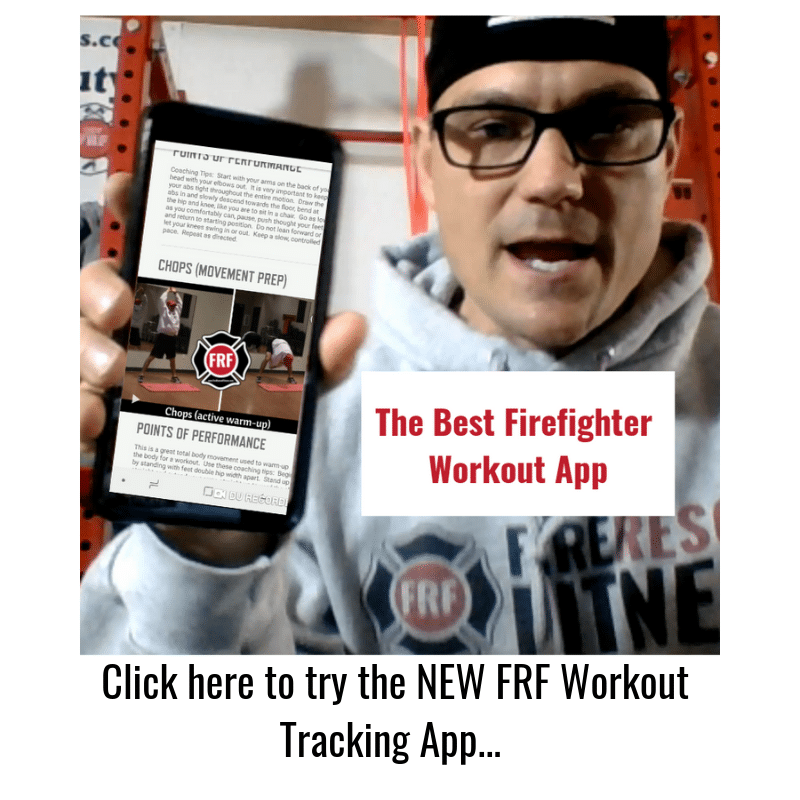 By now I hope you understand that creating an effective firefighter fitness program is more than just using weight machines or following the newest WOD (workout of the day) or fitness trend. 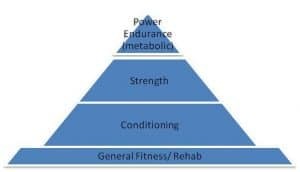 To develop an effective periodization program for the fire athlete, it is essential to understand the overall structure and goal of the program. Once that structure and goal is clear, the process of incorporating rest, variety, and progression becomes more manageable. The key to successful periodization is the ability to challenge the body with new activities and progressive overload (intensity). Three to four week cycles will get results. Just as the body experiences peak benefits of one cycle of planned workouts and starts to adapt to it, the athlete moves into a whole new three to four-week cycle that offers a completely new set of challenges. 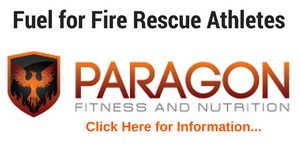 Need a program that follows these guidelines and will help any firefighter get “fit for duty?” Click here to learn about the Fire Rescue Fitness Ultimate Fire Rescue Athlete Program. American college of Sprts Medicine (ACSM). (2000). ACSM’s Guidelines for Exercise Testing and Prescription (6th edition). Baltimore, MD: Lippincott, Williams &Wilkins. IAFF/IAFC/ACE. (2006). Peer Fitness Trainer Reference Manual. Monterey, CA: Healthy Learning. International Association of Fire Fighters (IAFF). (2000). The Fire Service Joint Labor Management Wellness-Fitness Initiative. Washington, DC: International Association of Fire Fighters. Kraemer, W.J., Ratamess, N.A. and French, D.N. (2002). 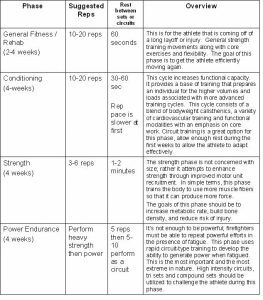 Resistance Training for Health and Performance. Curr. Sports Med. Rep. Vol. 1. Pp 165-171. Santana, J.C. (2003). The Essence of Program Design (The Ultimate Guide for Trainers & Coaches). Boca Raton, FL: Institute of Human Performance.